What a lovely evening- great food and I was able to enjoy my own dinner party- thank you Joe!! Joe was very friendly and professional the moment he arrived at our house. The food looked as beautiful as the ones posted and tasted exceptional. Joe's service was very good, together with the tidying, so we could just focus on our food and conversations, like being at a nice restaurant at home. It is such a treat esp given we have a 4 month baby at home, I highly recommend it. Delicious! All aspects of the service were perfect. The food, timing and absolutely impeccable clearing up afterwards mean that we will certainly be booking Joe again. It was a very pleasure for me and my guests to have Chef Joe Ouseley. He has great attention to any small detail and professional attitude. I really recommend his roast rump of new season's lamb with smashed potato, carrot and cardamom purée, delicious! The meal Joe prepared for us was extraordinary! I have not had such a delicious lamb in a long time. Also all the courses were prepared beautifully and with a lot of love to detail. I highly recommend Joel to anyone!! Joe masters the art of entertaining at home. His food is impeccably cooked and presented. He is tasteful, generous, polite and humorous. A real gentleman chef! Thumbs up! We had a fantastic evening with Joe! Excellent food and a very professional service! I've had a wonderful diner thanks to Joe Ouseley who proposed us a refined, fresh and delicious menu. I particularly enjoyed the foie gras ballotine, the tenderness of the lamb and the amazing lemongrass, passionfruit panacotta which had the perfect balance of sweetness and acidity. Joe cooked and prepared a truly exceptional dinner. All three courses were some of the best meals I ever had. I was sad it was over after the dessert! Not only is Joe a fantastic chef, he is also very polite, friendly and efficient. And the kitchen was cleaner after he left than it was before he arrived! Joe was fantastic, he called to confirm all the details, arrived with ample time, was friendly and made us feel comfortable to have him in our home. They food he produced was delicious, my favourites being the ox check ravioli and lemon tart. Joe was very friendly and made us all feel very comfortable in our home. The food was outstanding with the lemon tart being an exceptional end to a well thought out and detailed menu. The whole evening was an absolute delight. The food was exceptional with a lot of thought, care and preparation put into every course. The process was incredibly easy and Joe was both discrete and very charming! Joe gave us a five star evening in our own home without the stress of cooking and hosting, presenting food of an excellent standard. I would recommend him to any of my colleagues, clients and friends. The food was superb - a really enjoyable evening. I particularly enjoyed the Raviolo. Joe was a lovely and interesting guy, and I would certainly request him for our next dinner. What a wonderful evening! The food was outstanding and Joe was absolutely delightful. Everything worked so smoothly. We enjoyed all the dishes - they all came out looking absolutely beautiful and tasted exceptional. The food was cooked to such a high standard, we really loved the roast rump of lamb which was cooked to perfection! I really was amazed and all my guests agreed how nice it was to be able to dine at home without having to think or worry about it! I would highly recommend Joe. A really fantastic evening. The food was delicious, so tasty and perfectly cooked. It was also really nice to meet Joe who clearly loved cooking and enjoyed being there. Thank you very much. 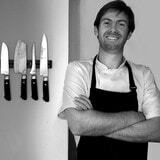 Fantastic chef, beautiful food and a really nice person to have around - thanks very much Joe! I cooked my winter tasting menu for 12 incredibly discerning foodies. I cooked at the very top of my game; I can honestly say that it couldn't have been better. It was extremely well received, an immensely proud moment in my career. Chilli con carne, still one of my favourites; but I must say it is a lot better now than 17 years ago. I have too many favourites to chose from! Adam Gray and Anthony Boyd. Both are Michelin starred chefs who taught me most of what I know. Both with very different cooking and management styles but extremely organised, great cooks and leaders. I would have followed them to Hell and back. If you believe this content violates or infringes your rights, Joe Ouseley may not know. You could solve this problem by contacting him.